We are all bombarded by content these days from email, texts, Facebook, Twitter, Instagram, Pinterest, LinkedIn, Tumblr, WordPress, and other social media we engage with. If you are like me, all this content can be overwhelming. Sifting through it all takes so much time and can be daunting (in her blog last week Doris describes how she is taming her email, for example). Yet, sift through it I do as contained in all the flotsam and jetsam are gold nuggets that contribute to my learning/working/thinking out loud (see my previous blog about learning/working online). Can we become content curators so we can find, use, and share these gold nuggets easily? There is a lot of information on content curation and management – just use a search engine and you’ll see. Many search results yield content management systems (CMS). Although CMS are helpful, more and more bloggers that I follow are emphasizing the importance of seeking out quality information using reliable sources, and sharing that information with networks. CMS are tools to use, but don’t sort through what is quality from what is popular or trending. 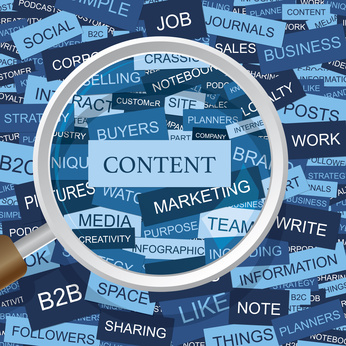 In 6 Powerful Tips to Effective Content Curation, Huffington Post, Business, from 11/29/14, the author Matthew Collis agrees with Harold Jarche: “There’s a huge sea of purportedly “helpful” content available on the web. But the truth is, a lot of it is actually poor quality, some is OK, and a small amount is the “gold” that everyone’s looking for. … Add value to what you’re sharing by supplementing the curated pieces with your own voice. Discuss why the content you’re sharing is relevant to your audience and key takeaways you’ve gleaned from it.” In other words, seek reliable information, make sense of it, and share your learning. 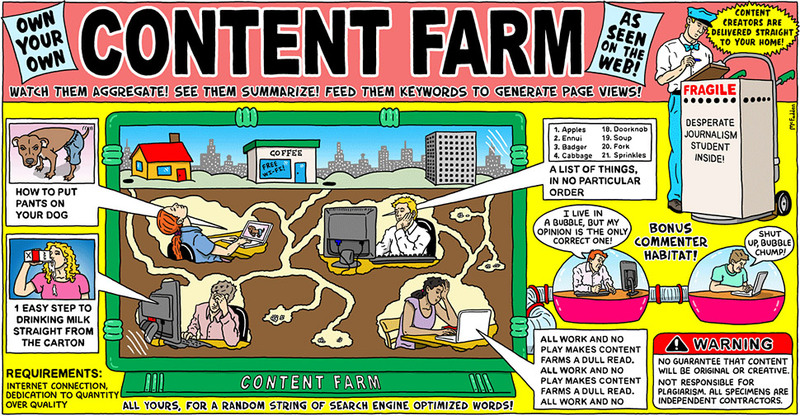 This cartoon, Content Farm, by Brian McFadden is from The Strip, New York Times, July 16, 2011 and is an amusing illustration of the content curation we don’t want to have to do! In our working out loud in this blog, Doris and I follow our trusted sources and find new reliable sources each week. We also seek out resources that help us with our services here at the Studio. I certainly agree with Beth Kanter – content curation is a great professional development activity. It also helps us network with those we admire and learn from and with. Although the sharing of our learning is the important outcome of our content curation, both Doris and I use Diigo as our content management system. This free tool allows us to bookmark resources (blogs, videos, photos, social media, etc. ), annotate the bookmark with what the resource is about and why we put it into Diigo. We tag our entries so that we can find them again easily with tags or keywords. We can also have an online conversation about the resource in Diigo if we choose. I go and use tags to search our Diigo group quite often to retrieve bookmarked resources and remind myself of what is there. There are other content management system tools out there – some free, some with a fee. Here is a link to Content Marketing Forum’s Ultimate List of Content Curation tools. Read the comments to get additions to their list (such as Diigo and ScoopIt). Best of all, we have created a Diigo group, the Women’s Learning Studio, so you can mine our collection as well. Do go and peruse our 3 year collection of resources on learning, leading, and connecting online. You can join the group and add your resources, too. We can’t wait to learn from you and see what you add to the collection!